The Whole30 Meal Template – a 1-page visual view of the meal template and serving sizes. The Whole30 Common Additives Cheat Sheet – I take this with me when grocery shopping to make sure all ingredients are Whole30-compliant. What is the Whole30? is for anyone new to the Whole30 program. I’m ready to do another Whole30 is a refresher for Whole30 veterans. I finished the Whole30 has info on reintroduction and life after Whole30. The Whole30 Forum contains posts on all things Whole30. As an Amazon Associate and affiliate for other brands Whole30CoachBrenda/Minimal Elegance LLC may earn a small commission for qualifying purchases. This does not affect the price you pay, and it allows me to continue to provide free content. Of course, I only recommend products that I use myself. I am truly grateful for your support. It Starts With Food is the first Whole30 book. It explains the science (the “why”) behind the Whole30 program, including a thorough discussion of the reasons why certain foods are eliminated.It gave me a new perspective when choosing the food I eat. The Whole30 is the encyclopedia of all things Whole30. If you can only buy one Whole30 book, then I recommend this one. It contains all the information you need for the Whole30 program, basic cooking techniques, tips, and lots of recipes. This Whole30 journal provides motivation, inspiration, accountability, pep talks, what to expect, habit-changing tips and food tips to keep you going throughout your Whole30. Food Freedom Forever helps you make the mindset changes necessary to reach your “food freedom” where you are in control of the food you eat, instead of the food controlling you. This book is the next step after your Whole30. The Whole30 Slow Cooker includes plenty of “set it and forget it” recipes for slow cookers and instant pots. The Whole30 Cookbook includes recipes for differing skill levels using a variety of cooking types to keep your Whole30 from food boredom. Thrive Market is an online store that sells all organic, non-GMO products at 25-50% off retail price. Using my link, you’re going to get an EXTRA 25% off your first purchase and a free 30 day trial. They have an entire section dedicated to the Whole30 items that Melissa Hartwig Urban has approved for Whole30 — literally taking any guesswork out of the equation. All approved products have been carefully evaluated by the Whole30 team, which also vets the company to make sure its offerings, core values, and mission are aligned with the Whole30 community. Chomps meat sticks are a convenient protein source when you’re on the go during your Whole30! No refrigeration required. This is a great collection to start with since there’s a little bit of everything. All items are Whole30-compliant. These items are handy for travel or to keep at the office or in your gym bag. One of my pantry staples is broth. I like to drink a mug of Kettle & Fire broth on a cold morning. Besides being full of key nutrients, amino acids, protein and collagen. it is so much easier than making my own and is great for my skin. The Free Meal Plans from Real Plans are a great way to get an idea of what Real Plans have to offer. The free meal plans are paleo which should comply with the Whole30 rules, but always check the ingredients and make sure it doesn’t violate the rule prohibiting making sweets, junk food, or treats from compliant ingredients. Use Coupon Code WHOLE30COACHBRENDA for a discount. You’ll need a set food containers for storing lunches, leftovers, chopped veggies & fruits, homemade sauces, and more. I like the Pyrex Simply Store 10-Piece Glass Food Storage Set with Blue Lids for the variety of sizes and glass feels a little more elegant for my lunch salads than plastic. I like to prepare ingredients and several meals on Sunday evenings so I have meals during the week that just need heated. That way, I can throw together a meal in no time. I also “batch” (double or triple) a recipe and freeze the extras. I like the Rubbermaid Easy Find Lids Food Storage Containers because there are lots of containers in a variety of sizes. I use the smallest for salad dressing for my lunch and a mixture coconut, nuts & seeds for emergencies or snacks away from home that don’t need refrigerated. These cutting boards are durable but light and thin so they’re easy to store. It’s also great that they’re non-slip and dishwasher safe. I have these boards in 2 sizes. The INSTANT POT is another way to save cooking time.It’s quick and easy to hard-boil eggs and make sweet potatoes. I especially like that I can saute veggies and ground meat, then switch to pressure cooker or slow cooker mode to finish cooking. Some of my favorite recipes to make in the INSTANT POT are Butternut Squash Soup and Zupa Tuscana Sausage Kale Soup. Whole30-compliant, non-dairy creamer. 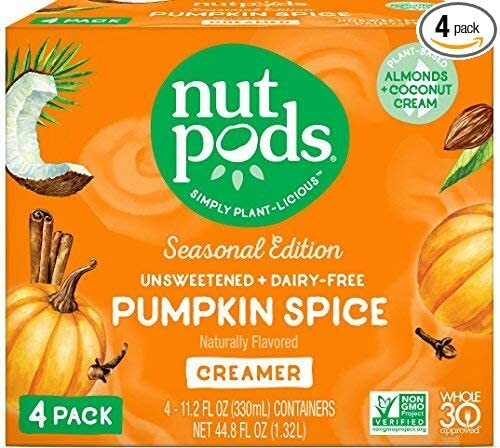 Pumpkin spice is seasonal, but so good when you can find it. This Whole30 water bottle holds 1 Liter/25 ounces and is insulated to keep drinks cold or hot. It’s a great size – large enough to stay hydrated.